AU’s Nicole Caporino (center) receives her award from Katherine Baucom (left), awards committee chair, and Michelle Craske (left), president of ABCT. 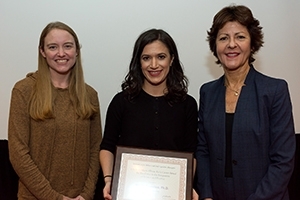 Assistant Professor of Psychology Nicole Caporino has received the first-ever Anne Marie Albano Early Career Award for Integration of Science and Practice from the Association for Behavioral and Cognitive Therapies (ABCT) at the association’s 50th annual convention in New York. The award was named in honor of Anne Marie Albano, director of the Columbia University Clinic for Anxiety and Related Disorder. She has devoted her career to studying and treating anxiety and mood disorders in children, adolescents, and young adults. “I’ve always been inspired by Dr. Albano and other leaders within ABCT who have advanced scientific approaches to understanding and improving child and adolescent mental health, so it was truly an honor to receive this award,” said Caporino. Caporino joined the AU faculty in fall 2016 as an emerging leader in the study of child anxiety and Obsessive Compulsive Disorder. “Her dedication to improving the efficacy and accessibility of evidence-based practices, and thereby the lives of children and their families, is evident in all facets of her work,” said David Haaga, professor and chair of the American University Department of Psychology. Caporino’s primary research interest is maximizing the efficacy of cognitive-behavioral therapy for anxiety and obsessive-compulsive disorders in children and adolescents. At AU, Caporino is working to open a child anxiety clinic on campus. It will become the university’s first child therapy facility for the general public. Haaga says that the clinic—and Caporino’s focus on integrating science and practice—exemplifies the best of AU’s clinical psychology PhD program. It can also make a real difference in improving mental health care for children and adolescents, he says, which depends on learning from on-the-ground observations as well as systematic empirical research that takes researchers beyond their own individual perspectives.